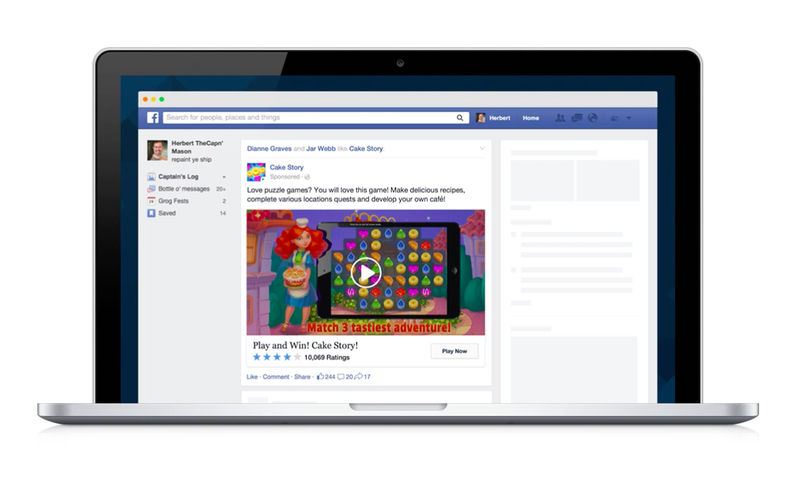 Facebook announced last week that it’s giving advertisers the option to include video in desktop app install ads. Previously, video was only available in mobile app install ads. Now Facebook is closing the loop for gaming, an activity that the company says has 445 million participants monthly across mobile and desktop. Facebook didn’t provide the mobile-desktop split for users or for the 130,000 new games it said were launched on Facebook last year, but now companies will be able to target desktop gamers with video. According to Robby Banks, Facebook principal, monetization, "We're now introducing the ability to use video creative in desktop app ads. Last year we launched video creative for mobile app install ads in Power Editor, and we're extending our investment in video to desktop to enable a more consistent buying experience across mobile and desktop app ads. This means that selected partners can start using video creative for desktop app ads in Power Editor andAds Create Tool"